Scott Lang (Paul Rudd) doesn’t like to call himself a robber. No, he doesn’t use force and only steals from those who probably deserve it - perhaps call him a cat burglar instead. A modern day Robin Hood if you will. Whatever the title, his life of crime is now all in the past. Lang, freshly released from prison, is desperate to move on and stay clean. He wants to build a new life and be the man that his young daughter believes that he is - her hero. However, life is certainly not easy for an ex-con. Lang finds that, despite his impressive qualifications, he is pretty unemployable. Fast losing hope, he agrees to do one more job. He breaks into a house that promises a healthy payoff. Unfortunately, this does not turn out to be the case and all he finds is a strange leather suit. Disappointed and yet also intrigued, Lang tries the suit on and shrinks to the size of an insect. The owner of the suit, Dr Hank Pym (Michael Douglas) contacts Lang and offers him a choice. He can either go back to jail or become Ant-man and go on a mission to stop Pym’s sub-atomic tech from falling into the wrong hands. I had a lot of fun watching Ant-man. I think a large reason for that is due to Paul Rudd and his lovable rogue performance. I warmed to him within the first few seconds, which meant that I cared about what happened to him. The first half of the film has a lot of set up to do - something that the movie does start to struggle with. However, the second half of Ant-man is really enjoyable with lots of daft action, cool tech and teams of extremely helpful ants. 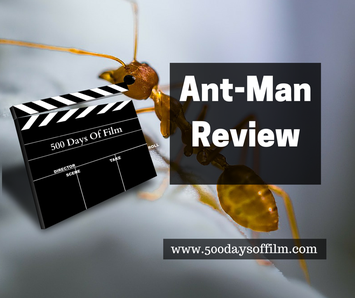 It felt to me as if the filmmakers were having lots of fun with the Ant-man concept. If Honey I Shrunk The Kids has taught us anything, it is that there is much hilarity in shrinking down to the size of an insect. This humour and Rudd’s performance keep the tone light and enjoyable - the film didn’t ever feel particularly tense and I did not really feel that the world was in real peril at any stage. That is not meant as a criticism. Ant-man is more focused on its domestic drama. Will Lang manage to live up to his daughter’s expectations? Will he be invited to her birthday party next year? That kind of thing. The fact that I remained engaged with the story was testament to the central character of Lang. I was more than happy watching him do his thing on screen. Ant-man was really enjoyable and a great addition to Marvel’s rapidly expanding stable of big screen heroes. I don’t think I’ll ever look at Thomas The Tank Engine in the same way again. Great to see Evangeline Lilly on the big screen again.